The increasing complexity of insurance and reinsurance products has seen a growing interest amongst actuaries in the modelling of dependent risks. For efficient risk management, actuaries need to be able to answer fundamental questions such as: Is the correlation structure dangerous? And, if yes, to what extent? Therefore tools to quantify, compare, and model the strength of dependence between different risks are vital. Combining coverage of stochastic order and risk measure theories with the basics of risk management and stochastic dependence, this book provides an essential guide to managing modern financial risk. * Describes how to model risks in incomplete markets, emphasising insurance risks. * Explains how to measure and compare the danger of risks, model their interactions, and measure the strength of their association. * Examines the type of dependence induced by GLM-based credibility models, the bounds on functions of dependent risks, and probabilistic distances between actuarial models. * Detailed presentation of risk measures, stochastic orderings, copula models, dependence concepts and dependence orderings. * Includes numerous exercises allowing a cementing of the concepts by all levels of readers. * Solutions to tasks as well as further examples and exercises can be found on a supporting website. 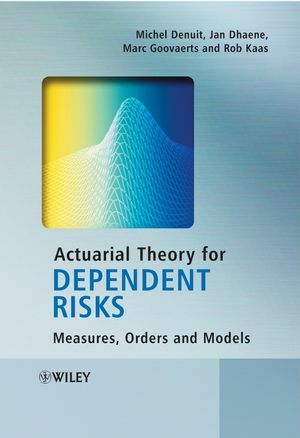 An invaluable reference for both academics and practitioners alike, Actuarial Theory for Dependent Risks will appeal to all those eager to master the up-to-date modelling tools for dependent risks. The inclusion of exercises and practical examples makes the book suitable for advanced courses on risk management in incomplete markets. Traders looking for practical advice on insurance markets will also find much of interest. Michel Denuit – Michel Denuit is Professor of Statistics and Actuarial Science at the Université catholique de Louvain, Belgium. His major fields of research are risk theory and stochastic inequalities. He (co-)authored numerous articles appeared in applied and theoretical journals and served as member of the editorial board for several journals (including Insurance: Mathematics and Economics). He is a section editor on Wiley’s Encyclopedia of Actuarial Science. Jan Dhaene, Faculty of Economics and Applied Economics KULeuven, Belgium. Rob Kaas, Professor of Actuarial Science (Actuarial Statistics), U. Amsterdam, The Netherlands.